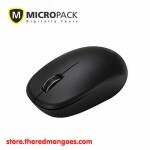 Features - Share one mouse with two devices - High resolution 1200 CPI for enhanced productiv.. Features - 1200CPI Wireless Optical Mouse - V3.0 Bluetooth with low battery consumption - W.. Product Specification : Produk Number : EMS117BKAA-IF Connection &n.. Product Specification : Produk Number : EMS118BKAA-IF Connection &n..
Ultra quiet clicking buttons provide distraction-free navigation 2.4G Wi.. Reliable 2.4Ghz wireless - Strong, consistent wireless connection from distances up to 10-meter..
Plug-and-play wireless: Get a reliable connection from a convenient nano receiver that stays ..
A compact wireless mouse with high-definition tracking Contoured design 1-year ba.. ENJOY THE SOUND OF SILENCE - Get all your work done without missing a beat or disturbing those ..
Blue Tech - Blue tech feature allow the mouse to work on almost any surface, including glass ..
RF 2.4G Wireless - RF 2.4G technology, up to 10 meters wireless range 1200 DPI - 1200..
RF 2.4G Wireless - RF 2.4G technology, up to 10 meters wireless range 1000 DPI - High..
Windows touch tab for easy access to apps andthe Start Screen Wireless Bluetooth connec.. Designed for Comfort and Portability Design is suitable for use with eit..